'We Need Her': At The Super Bowl, Missy Elliott's Incredible Return The rapper and producer hasn't released an album of new songs since 2005, but on Sunday night her old hits were more than enough. 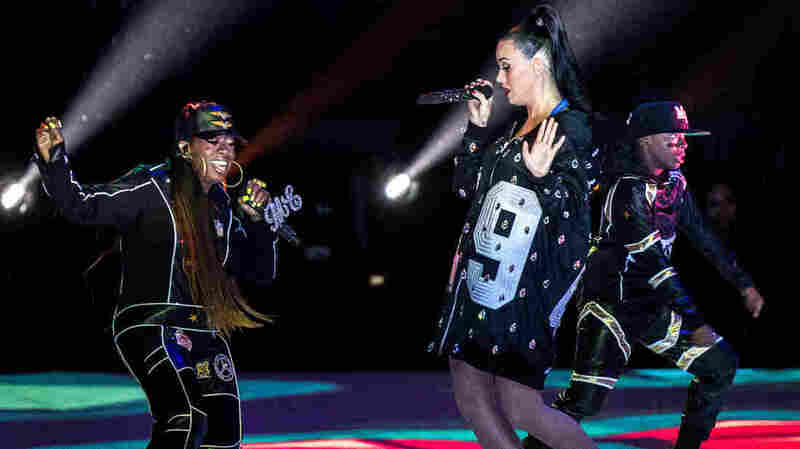 Missy Elliott (left) joins Katy Perry during the 2015 Super Bowl Halftime Show. Sunday night, in the middle of Katy Perry's flashy Super Bowl Halftime Show featuring dancing beach balls and sharks, rapper Missy Elliott and her dancers dropped in. They stole the show with a three-song medley of "Get Ur Freak On," "Work It" and "Lose Control." Those songs are, respectively, 14, 13 and 10 years old, so any teenagers watching might be forgiven for assuming Elliott was a brand new act that Perry was introducing to the world. But Elliott is one of the most revered rappers and producers of her generation. As Microphone Check co-host Frannie Kelley tells NPR's Audie Cornish, "Without Missy, there is no Nicki." Still, she's been quiet lately. Elliott hasn't put out an album of new music since 2005. "She has said that she has Graves' Disease, which is a disease of the thyroid and has very different symptoms depending on the person who has it," Kelley says. "She has said there's been times where she couldn't even pick up a pen to write songs." "She's also spoken about the pressures of following her wild success less than 10 years ago, and also sort of not being inspired by new sounds, wanting to make something really different, and maybe even also wanting to be an underdog again — to come out and shock the world," says Kelley. You can hear Frannie Kelley's conversation with Audie Cornish at the audio link.